John-Michael Tebelak (November 1, 1949—April 2, 1985) was an American playwright and director. He was most famous for creating the musical Godspell based on the Gospel of Saint Matthew. The music was by Stephen Schwartz. Some of the lyrics are original, with others taken from either the Bible or traditional hymns in the 1940 Episcopal Hymnal. 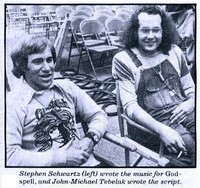 Tebelak originally produced Godspell at age 22 as his masters thesis project, under the tutelage of Lawrence Carra, at Carnegie Mellon University in December 1970. He had been studying Greek and Roman mythology, with the deadline for his thesis two weeks away, but became fascinated by the joy he found in the Gospels. He attended an Easter Vigil service in 1970 at Pittsburgh's St. Paul’s Cathedral, wearing his usual overalls and T-shirt. A police officer frisked him for drugs after the service. He wrote of this experience, "I left with the feeling that, rather than rolling the rock away from the Tomb, they were piling more on. I went home, took out my manuscript, and worked it to completion in a non-stop frenzy." Though he never completed his coursework at the university, Carnegie Mellon nevertheless awarded him a degree. Subsequently, Tebelak directed productions of Godspell at La MaMa Experimental Theatre Club, the Cherry Lane Theatre, the Promenade Theatre, and on Broadway. He was named Theatre Man of the Year by Elliott Norton of the Boston-Record American, and Most Promising Director of 1971 by the New York Drama Desk. He was also named an Outstanding Ohioan by then-Governor John J. Gilligan. John Michael Tebelak graduated from Berea High School (Berea, Ohio) in 1966. Tebelak died on April 2, 1985 of a heart attack in New York City at age 35. He was survived by his parents, John and Genevieve Tebelak, his sister Trudy Williams and niece Abbey Williams. I was in a few plays with Mike at Berea High. I always knew he would go somewhere great with his love for the theater. His creation "Godspell" had a profound effect on my life at a time when I was spiritually floundering. I will never forget him and the joy Godspell continues to bring to me when I listen to the music, or see the play again......... thanks, Mike. Thanks for the add. I knew John Michael - a we called him- in college when he was writing Godspell. I was dating one of his house mates where he lived in Oakland, PA. I was attending Unv of Pgh. I was excited to be able to attend the first production of the play. He was a sensitive, passionate, if not somewhat reclusive person with extraordinary genius. I look back on my time with these friends as a very special time in my life and I know if he had lived longer would have continued to make original creative contributions to our world.